After the mass shooting at Marjory Stoneman Douglas High School in Parkland, Florida, students at MDI High School in Bar Harbor, Maine were scheduled to have a routine lock-down drill, in which students practice how to behave if their school is the site of a similar mass shooting; these drills teach children to sacrifice themselves by distracting the shooter before they are murdered in order to give other students a few more seconds during which the police might arrive and kill the shooter. The school principal decided to postpone the drill, and instead, 50-100 of these students staged a class walkout to demand gun-control, lining the halls with signs bearing slogans like "Students safety before gun owners rights" and "Put Senate on lockdown until students are safe"; some teachers joined the protest. The protest continued through the day and culminated with a solidarity protest in front of the school that included parents and members of the community. Students across America are planning a mass walkout for gun control on March 14. Most high-school seniors will be old enough to vote in the 2018 midterms, and almost current high-school students will be eligible to vote in the 2020 elections. A new campaign called No NRA Money is devoted to electing politicians who do not take campaign funding from the NRA and "make the NRA politically radioactive." According to the student organizers, Dawson Burnett reached out to Mackenzie Miller and a few others to see if there was any interest in holding a protest. After the shooting in Florida on Wednesday afternoon they were feeling inspired to take action. 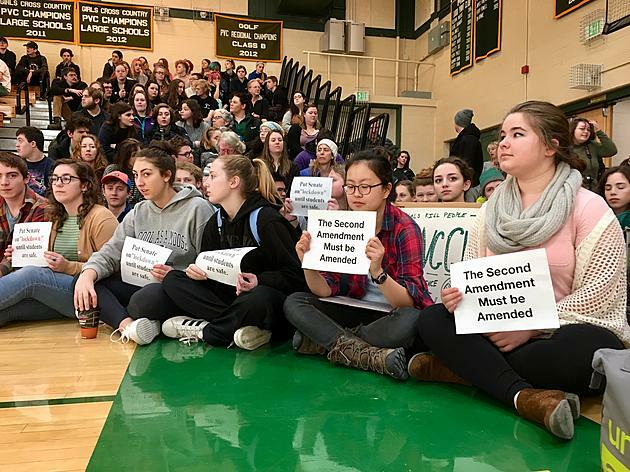 With the scheduled lockdown, they thought it would be a good idea to hold a silent protest showing their sadness and outrage with the government on their lack of care towards the safety of American students. Signs read "Students safety before gun owners rights" and "Put Senate on lockdown until students are safe" among other things. They felt like unless students stand up and voice their concerns, nothing will change. They believe that the safety of American children should be the number one priority of the American government and if that means stricter gun control then so be it. They started the protest at 7:30 AM in the hallway with 30 students and throughout the protest ended up with another 60 or so students as well as some teachers. They do not want to become part of a statistic. There have been 18 school shootings so far this year, something needs to be done.